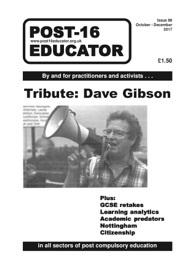 Newcastle University University and College Union (UCU) branch has released a report describing how, through a successful but “painful” campaign that ended in a marking boycott, it convinced university management to drop a top-down and coercive performance management system called ‘Raising the Bar’ in favour of a “collaborative, bottom-up approach to improving research”. Significantly for higher education activists and trade unionists, through the dispute Newcastle UCU showed that “academic staff are intrinsically motivated to perform well”. The “Newcastle experience” – backed up by a “substantive body of research” – forcefully points to the fact “that attempts to extrinsically motivate those who are already intrinsically motivated, is counterproductive because it actually produces a reduction in overall motivation and job satisfaction”. According to the report, ‘Raising the Bar’ (RTB) was Newcastle University management’s attempt to “‘game’ key metric exercises of the REF and international reputational league tables”. The report describes how management introduced “targeted” Units of Assessment deemed “best-placed” to rise up the tables and introduced an ‘Outcomes-Based Management’ (OBPM) system, which attempted to “embed a range of ‘Research and Performance Expectations’ (RiPE) targets in personnel management”. The report recounts how, just as industrial action began in June that year, Newcastle University vice chancellor Chris Brink, with the support of the University’s Heads of Academic Units (HoAUs) and in negotiation with Newcastle UCU, “agreed to abandon RiPE and to ditch the RTB terminology”. In its place, a framework for a “common understanding in moving forwards” was agreed between the University and UCU: the ‘Academic Framework for Research Improvement’ (AFRI). Newcastle UCU has made the full report available on its website, which goes on to describe the lessons learned from this successful dispute for management and UCU. The report is recommended reading for activists and trade unionists in higher education (HE), as such top-down and coercive performance management is becoming the norm in a sector besieged by market reform. New vice chancellor Chris Day has also released a statement accepting all recommendations proposed by the Newcastle UCU report, which can be found here. University and College Union (UCU) members at the University of Birmingham are moving towards a formal ballot in an escalating dispute with management over a new workload allocation model (WAM), top-down performance management and proposed changes to disciplinary proceedings. Birmingham University UCU (BUCU) branch intend to run a formal ballot for industrial action next month, following a consultative ballot earlier this year in which members showed a willingness to take action regarding these issues. If members vote positively in the formal ballot, BUCU aim to begin strike action at the beginning of Spring term 2018. Escalation follows a number of attempts by the UCU branch to “engage in a constructive way” with Birmingham University management. After a series of meetings that led nowhere, it concluded that the university “intentionally maintained regular meetings with BUCU in order to mislead BUCU”. “As such, this branch does not believe any longer that the University has been negotiating with BUCU in good faith to resolve the issues around performance management at the University of Birmingham but has breached the implied duty of trust and confidence,” BUCU concluded. BUCU claims that the new workload allocation model would add an extra two months for academic staff. To highlight the issue, BUCU held a demonstration (see picture) during which members held up mock calendar placards featuring two new months “Drainuary” and “Stresstember”. Birmingham University has also been in the papers recently for being one of the universities with the most ‘zero hour’ contracts in the country and also one of the highest numbers of settlement payments.